I have been interested in a 42 with centerline queen. However, we see some interesting differences when you look at the offset berth including the availability of 2 heads and lower asking prices. Can someone get me measurements of the width of the head and foot of the offset berth. The 1980 vintage KK 42's I am familiar with (1983 & 1987) have what I would call a full sized bed or double bed - not a queen. The front Master cabin configuration that has only one head & 1 master centerline bed / birth will accept a full sized double bed from any bed store. However, Does not fit a queen sized mattress that I have seen. Later models may be different. When you have seen one KK 42 - you have only seen one KK 42. However the off set master cabin that has the bed / birth on the starboard side for that configuration master suite gets narrower down where you feet go that are more toward the front of the bow area. That will NOT accept a standard sized full size or double mattress. So narrower than standard size for that configuration. Example of front master cabin full sized bed - NOT Queen ! 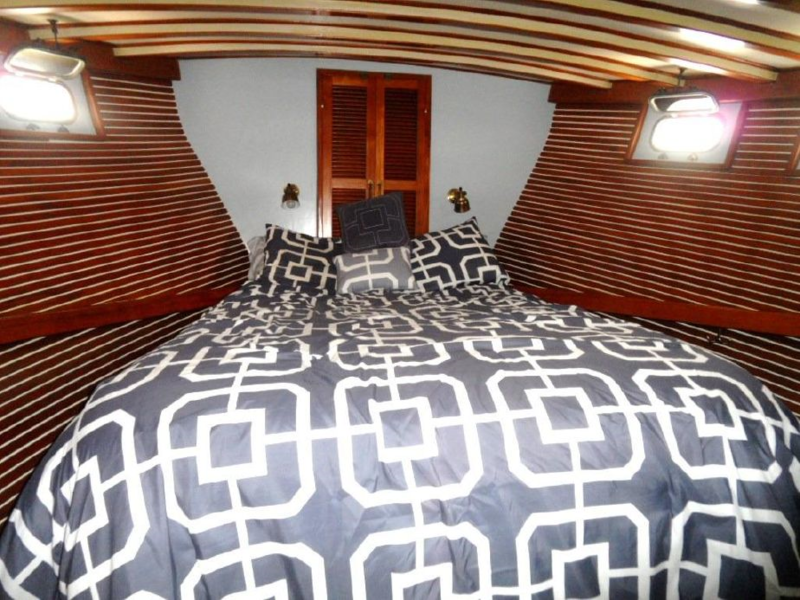 Note: it is tapered at top corners or what might be called at the shoulders of the bed up by where you head would be & up by the anchor locker access doors as the bow comes in there & there is limited room to work with for a real 100% full sized standard off the shelf bed mattress. So they trim the upper corners a bit in & that works. Here is the starboard master cabin double birth - which is also a modified full sized bed. -- NOT A QUEEN BED ! Note that it is tapered as you go foreward toward bow where your feet would be. In my experience with a "climb over each other" bed is that you will learn to hate it. And if the climbing is no fun, try changing the bedding. Just my opinion as others have no issue with it. Hate the fisheye lens photos. Wish they wouldn't do that on these sales sites! We have an offset master "Queen" and it's fine. I don't like putting the sheets on the bed but my wife insists on doing it, so that works. She has her methods. I'm 5'8" and I take the outside as I'm the one most likely to get up in the night. We would choose that with the second head. Some people don't like the offset mattress but we are fine with it. We like the second head that is plumbed for direct discharge. It saves on water when we travel remote areas. This is what turned us off that KK. The master is in the bow, and a convertible office with a pullman bed for a second cabin? Now the 48 was interesting. But basically same set up. Still the master in the bow, in a 48? Master in the bow gets the best airflow at anchor. And with this hull, no annoying chine slap like in my old Mainship. Its a trade off for 2 staterooms with a single level cockpit/salon/swim platform (not raised or flush deck) fit into a 42' boat. I didn't want an aft cabin. As for climb over bed, we are younger than some, so not a bother. We did modify the center drawer into a pullout step. Makes things alot easier. For us the second stateroom is a pantry/storage room that someone may sleep in occasionally. To OP, I am 6'0" and sleep next to the wall using the angle for more matress length. On occasion it feels tight. Any taller and I wouldn't be happy. Master stateroom at the bow. In the Eastern Caribbean wouldn't have it any other way. At anchor we get a constant breeze through the hatch above the berth. Friends with midship berths (Nordhavn 46) have run the airconditioning to make sleeping pleasant. While we are usually at anchor, when we do go into a marina me make sure we are bow to the wind for sleeping. If it were not for the wind at anchor the preferred location of a master stateroom would be midship. Especially when underway on multi-day passages. The fore and aft pitch is less at midship. We tend to use the couch in the salon for sleeping on rough multi day passages. Of course we have seen more head seas on our route than most.